A visit to Maharashtrian wedding, “masale bhat” will be served on the platter-damn sure! An awesome trio ‘jalebi-masale bhat-maath’ is just heavenly. The traditional spice masale used in it makes it more aromatic and yummy. 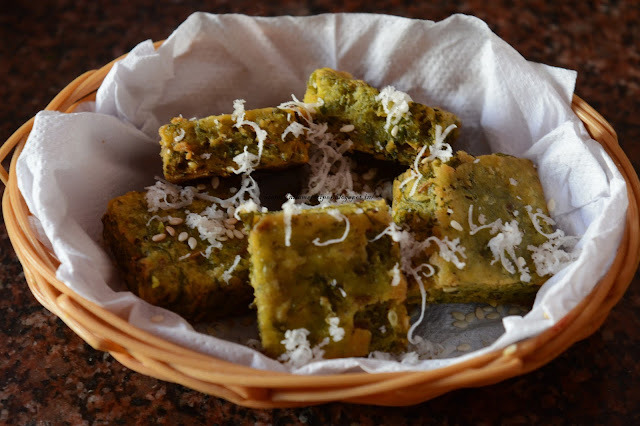 The taste of masale bhat lingers into the mouth quite a long time after eating. Masale bhat is a completely nutritious one plate meal best enjoyed with sadha varan, mattha or simply curd raita. You can add your choice of vegetables or available vegetables to the rice dish. Eventhough, we can have masale bhat in weddings, lets learn to make this at home. Read more! In a pan dry and roast above all ingredients till fragrant and grind to fine powder. Wash, rinse and soak rice for 30 minutes in enough water. Rinse and chop all the vegetables. Now add all vegetables chopped cauliflower florets, carrot,Potato Cubed, Chopped Tomatoes, green peas. Heat 3.5 cup water and bring it to a boil. Add the red chili powder, dry masala and saute it. Add boiled water and stir it well. Then add soaked rice and saute for a minute. Add salt and check the taste of water and if required add salt or spices. Cover the pan with lid and simmer the rice to medium low heat till rice cooked well. Do check in between if require add little water. Dry roast cashew nuts or by adding little ghee you can fry till golden brown. Once the rice is cooked take off from flame let it stand in pan for another few minutes. When serving masala bhat add a spoonful of ghee, chopped coriander leaves and roasted cashew nuts and grated fresh coconut. Serve masala bhat with yogurt, papad and lonch (achar). 1) Wash, rinse and soak rice for 30 minutes in enough water. 2) Rinse and chop all the vegetables. 3) Heat ghee in pan, add the mustard seeds once it crackle add cumin seeds, asafoetida, bay leaf and curry leaves. 4) Now add all vegetables Chopped cauliflower florets, carrot, potato cubed, chopped tomatoes, green peas. 5) Saute the vegetables for 4-5 minutes. Heat 3.5 cup water and bring it to a boil. Add the red chili powder, dry masala and saute it. 6) Add boiled water and stir it well. 7) Then add soaked rice and saute for a minute. 8) Add salt and check the taste of water and if required add salt or spices. Cover the pan with lid and simmer the rice to medium low heat till rice cooked well. 9) Do check in between if require add little water. Dry roast cashew nuts or by adding little ghee you can fry till golden brown. 10) Once the rice is cooked take off from flame let it stand in pan for another few minutes. 11) When serving masala bhat add a spoonful of ghee, chopped coriander leaves and roasted cashew nuts and grated fresh coconut. Serve masala bhat with yogurt, papad and lonch (achar). Older PostGudi Padwa | Gudhi Padwa Special Recipes!